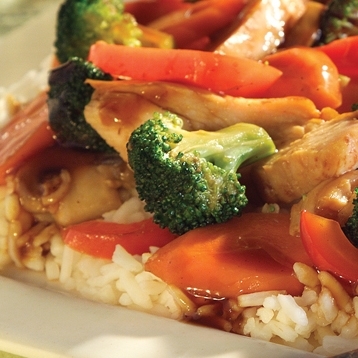 Try this chicken vegetable stir fry for a nice light lunch or dinner. You can make it a hearty meal by plating it with some rice. The flavors in this chicken recipe bring you the taste of the orient. By using skinless chicken breast, this one is only 1 SmartPoint on Weight Watchers new FreeStyle program. Of course you have to track your points for the sides you add to your meal. You can change up the veggies to your favorites without impacting the points. If you are counting calories, carbs or other nutrition, be sure to adjust for the different veggies you add or change. We love a good stir fry and it's fun to mix up the flavors by seasoning the veggies and meat with different sauces. Mix broth, soy sauce, garlic powder, ginger and cornstarch in a small bowl until smooth. Set aside. In a large non-stick skillet, heat half the canola oil on medium-high. Add chicken and stir fry for about 5 minutes (or until chicken is cooked through). Add additional oil if needed. Place vegetables in skillet adding remaining canola oil and sesame oil and stir fry for about 3 minutes. Stir the soy sauce mixture and pour into skillet. While stirring constantly, bring to a boil. Continue to boil for about 1 minute or until sauce is slightly thickened. Plate and serve (you can put over rice if desired). Nutrition facts shown below are per serving for this chicken vegetable stir fry recipe. The number of serving is noted in the header section below. The serving size is the first item noted on the nutrition facts table. The Freestyle SmartPoints do not include nutrition for the chicken or veggies. The other points do not include the veggies. You can add, change or remove vegetables to your liking. If everyone has a favorite, just cut veggies in big enough chunks that you can grab what you like while making your plate. 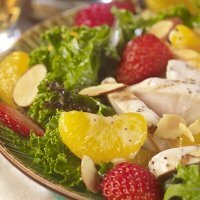 I always look forward to when fresh fruits are in season so I can make this juicy chicken summertime salad. 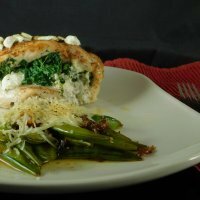 Your mouth will be watering wanting this stuffed with creamy goodness chicken breast recipe. 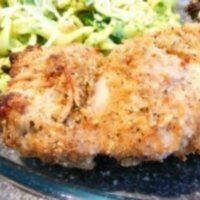 These baked thighs have a fantastic flavor and crunch from the parmesan and seasonings in this recipe. 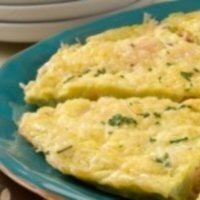 This frittata is perfect for a unique breakfast or brunch. With the added benefits of the fish, this makes a healthy meal. 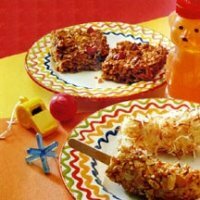 If you are looking for something sweet and fun to make for dessert, then give this recipe a try. So easy kids can help. 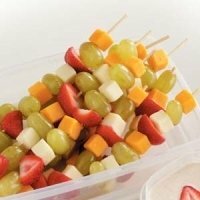 This is such a quick, easy and delicious appetizer recipe that will go great at parties or a quick snack idea. Appetizers are a great way to start your meal. If you are looking for something new, then check out this page. Check out these super foods and add some to your recipes and meals. Because who doesn't want to feel good? Make sure you know what means what on the foods you buy. Understanding the labels can help you make healthier choices.